Aron White is another stud tight end that the Dawgs seem to get every year. Ranked the #1 TE in America by Rivals in 2007, he earned Super Prep and Prep All American honors. One of just 3 players from the state of Missouri to play in the inaugural Offense- Defense All American Bowl Game in Ft. Lauderdale, FL. He was high school teammates with Georgia backup QB Logan Gray in Basketball and Football. White was redshirted last season and is the type of future offensive star that fans of teams like Tennessee and Florida don't even realize we have on campus. Depth Chart Analysis: White will enter the fall #3 behind Tripp Chandler and Bruce Figgins. He will get plenty of snaps especially in passing situations and could develop into a offensive weapon this season in the mold of Dawg great Randy McMichael. His skill set at TE reminds me of a young Tony Gonzalez. He may wind up getting snaps at wide out in certain situations. Pretty sure White switched to #81 after NaDerris left. He, along with Israel, should be a factor by mid-season. 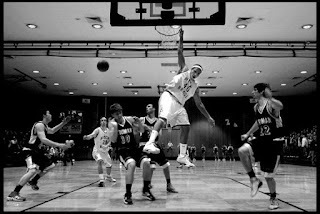 Great picture of White dunking! He does look a lot like Gonzalez playing hoops back at Cal there. White is probably the new offensive player I'm most excited about seeing play for us. If you look closely, he is bricking the hell out of that dunk. 10:53...yeah you're right. Looks like it's gonna end up an outlet pass going the other way. Does it really count if you are dunking on all white boys? It does if you are half white yourself! As has been noted in previous blogs, the player we countdown may not always correspond with the actual countdown day. We're going by the current official UGA roster, which doesn't always reflect changes from spring. The main goal is that every player is identified at some over the 100 days leading up to the 1st game. Thanks for reading.